Home-made cake baking and decoration company, catering for birthdays, weddings, tea parties and any other celebration. We also make cake bites and cake pops. Bespoke Cakes made to order. Based in the gorgeous riverside town of St Ives in Cambridgeshire. We create bespoke celebration cakes for any occasion, based on your requirements and ideas, as inspiration. So what makes us bespoke? Well, for one we do this for love, not to make money. Secondly we make each cake to a customers exact specification, not copied. Cakes are baked fresh, and apart from our fruit cakes, they are not made more than 3 days before required. We use the best quality ingredients we can find (homemade or locally produced if at all possible), and are passionate about fairtrade. We can cater for those with special dietary requirements. We believe Cake is for everyone, even if you need to make a few changes :o) Please note: I do use nuts in my kitchen, so I can't guarantee any cake will be nut-free. Throwing a get-together? Having a tea party or club meeting? We can also cater for you! Just scroll down the menu to Tea Parties where you'll find more information. Children's Cupcake Parties! An hour's peace for you, and an hour's fun for those attending the party. For more information please scroll down the menu to Classes and Party packages. 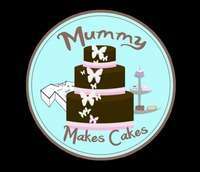 Mummy Makes Cakes is located in St Ives Cambridgeshire, and is registered with Huntingdonshire District Council's Environmental Health Department. I also hold a level 2 qualification in food safety for catering, DBS checked to work with children for my daytime job, and am fully insured. Please remember deposits are required on all cakes before your order is accepted. We accept payment by cash, cheque or via bank transfer. Thank you! Weddings - Why do people charge more? ?